As is obvious, the Nexon has taken a very different line of attack on the sub-4 metre SUV segment. 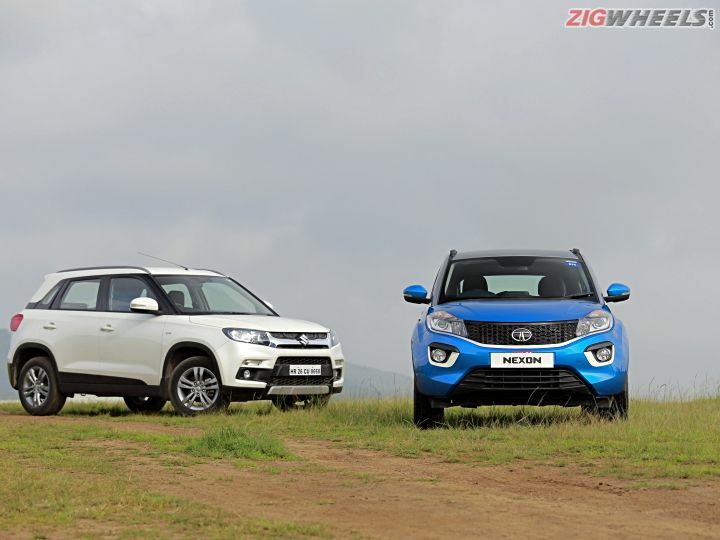 Be it the stylish Tata or the well entrenched Maruti Suzuki Vitara Brezza, they try to fill the spot in your garage, but which one makes for the more versatile, more appealing all-rounder? We have a whole list of questions that needs to be answered by these diesel SUVs. Now, let’s get cracking! Q1: Which one has the attitude of an SUV? Ans: That’s got to be the Brezza. From its upright A-pillar, flat roof and straight lines it just has the quintessential SUV-like stance. The Brezza also stands a bit taller than the Nexon - by 37mm. But the Nexon is wider by 21mm as well. More importantly, it’s the Nexon that has more ground clearance: 209mm for the Tata vs 198mm for the Maruti. In terms of design the Nexon is clearly a crossover, and from some angles it still can’t shake off the Vista connection. Q2: Which one looks better? Ans: We found that the Nexon turned a lot of heads. Lots! People in more expensive cars stopped by for a look. Also, some people didn’t recognise it as a Tata. So those swoopy lines and dramatic design elements seem to have hit the mark. However, we will nitpick a bit. The poor fit of the white sash mars the premiumness somewhat and we expect that the other white elements won’t age quite as well as the rest of the design. The Brezza has been, well, inoffensive and you won’t fall in love with it. But it won’t put people off either. Q3: Which one feels more special on the inside? Ans: Nexon! Design elements like the floating 6.5-inch screen on top, to the cross-hatched textures for the plastics and the glossy finish for grey strip on the dash all come together to create a premium ambience. Basically, the Nexon is punching well above its price class in terms of the feel on the inside. In terms of outright quality of materials or build quality there really isn’t much to separate the two. In fact the Nexon’s fit and finish feels a bit tacky in some places. Up until now, the Brezza has had a rather blameless existence, but after sitting in the Nexon, these textures, the shiny finishes and the bland design feels a bit blah! Q4: Which one packs more features? Ans: Let’s get this out of the way first -- neither car has a sunroof. Clear? Now, moving on to the Brezza. Yes, it’s the older car here, but it packs in more features. Surprised? First and foremost, it has the bigger touchscreen that is also more responsive to use. Its reversing camera also has much better resolution than the Nexon’s. That aside, you get automatic headlamps, automatic wipers and cruise control on the Maruti. The smaller details are well thought out here. Two glove boxes, ample cubby holes and simple cupholders are all very functional. The Nexon has issues. The door pockets in the Tata are a bit clumsy. The tambour door opens the wrong way, and the cup holders hidden underneath are just too hard to reach. The touchscreen is laggy when you use your fingers and the reversing camera’s poor resolution makes it practically useless in the dark if the surroundings are not well lit up. But the Nexon has its witty bits like the these physical shortcut buttons for the infotainment system. These make it much easier to control the volume without taking your eyes away from the road. That 8-speaker Harman music system is a win for sure. And let’s not forget, it’s the only one here with rear air con vents and blower controls. When it comes to safety features the Nexon get ABS, EBD and dual airbags as standard! Whereas in the Brezza, ABS and dual airbags are optional for the LDI and VDI variants. Q5: Which has the more spacious cabin and which one is better for three at the back? Ans: Just by a bit, it’s got to be the Brezza. At the front, the more upright A-pillars create a sense of roominess. It also has more shoulder room and the seats have better side bolstering to hold you in corners. Now, in the Nexon the cabin feels more cozy, courtesy of the racy design, and counter-intuitively, it’s in the Nexon that you end up sitting higher up off the ground. We are not complaining! When you step into the back of the Nexon you realise that stepping in for older people or sari-clad ladies will require some effort to step up to the higher floor and across the sill. Once inside, you get more knee room here and it also has the better sculpted seats. But the seat cushioning is a bit too soft, and, because of the swoopy design, the cabin doesn't feel as airy as the Maruti’s. The Brezza looks simple, but it delivers. It has more shoulder room here, and it’s got the wider backseat as well so it can accommodate three better. The seat cushioning is also firmer than the Nexon’s, and will make it less tiring, especially on longer journeys. Q6: Which one has a better boot? Ans: Brezza! On paper the Brezza’s 328-litre boot is smaller than the Nexon’s 350-litre boot; however, the Maruti has the better shape to pack in luggage. In the Nexon the second row folds down flat, but the Brezza goes one better as the boot floor becomes truly flat. Also, the loading lip is lower in the Brezza and that makes it easier to load luggage. Q7: Which one these would you be happier driving around in the city? Ans: Hands down it’s the Nexon! The new 1.5-litre engine’s responsiveness at low rpms is phenomenal. So, in stop-go traffic you don’t have to shift gears too much as it pulls from 1000rpm! The City mode makes driving in stop-go traffic smoother still as it smoothes out the bump up in torque at 2000rpm. The use of a six-speed gearbox gives it an added advantage, letting you leave it in third gear for the better part of your commute. The light clutch takes stress down another level. For the record the Nexon has 260Nm of torque - that’s 60Nm more than the Brezza. And the combined benefits of this is evident in the quicker roll-on acceleration tests too. The Nexon’s suspension is another big plus. You can glide over speed breakers, run over potholes, and the soft setup means you feel just a bit of the harshness only. On the other hand the Brezza’s suspension setup is on the firm side, which means you can feel a lot more of the road. Also, in bumper to bumper traffic the 1.3 litre diesel engine feels a bit like Dr Jekyll and Mr Hyde. Mild or wild. Work the gearbox and you can choose to commute as your mood desires. Q8: Which one is more apt for highway use? Ans: Brezza! Don’t be surprised! Yes, it only has 90PS to the Nexon’s 110, but the Brezza is some 110kgs lighter too! it’s more eager to rev and that helps as well. Past 2000rpm the Brezza’s engine is quite eager. It revs quickly, and doesn’t lose too much steam even as it heads to its near-5000rpm redline. So when you are on an open road or when you want to pass a fast-moving vehicle up ahead the Brezza feels more peppy. Look at the 0-100kmph numbers and it’s clear that the Maruti is saucy. Yes, the Nexon is slower in that test. But shift to Sport mode and you get the full 260Nm of torque to play with. This mode is a couple of seconds quicker in the run from 0-100kmph when compared to the City mode. So the Nexon’s engine adapts, but it doesn't like to be revved and rushed. At highway speeds both these SUVs feel planted, but interestingly the Nexon has the quieter cabin. Q9: Is one of these fun to drive? Ans: Yes! The Brezza feels so feisty! Chuck it into a corner -- it rolls a bit, settles down, and then cuts right through! Yes, it is a bit fidgety, but more experienced drivers will enjoy it. We couldn’t help but wish for more grip from its Apollos though. Meanwhile, the Nexon can’t be called fun. The chassis is confident and the grip from the Goodyears is incredible. It feels safe and secure, but we wish it was more agile. Also, the engine lacks the zest at higher revs. The clutch engagement is also quite sudden, and the long throw and loose shift mechanism can be a bit annoying when hustled. Q10: Which one is more fuel efficient? Ans: Paaji! Maroooti! Out on the highway the Brezza returns a staggering near-25kmpl when driven at a reasonable pace. The Nexon, though, isn’t too far behind! In the city the gap widens dramatically. The Brezza returns just under 22kmpl in our standard test conditions while the Nexon’s number drops to 17kmpl. This can be attributed to the Nexon’s larger engine, higher kerb weight and shorter gearing. Q11: So which has the most niggles? Ans: You could accuse the Brezza of having body panels that feel flimsy, whereas the Tata feels solid. But everything on the Maruti works the way it’s supposed to. Which is something we can't say for the Nexon. We had several issues with the Tata - the starter motor jammed, the door lock got jammed, then the DRLs and rear tail lamps stopped working. Which needed it a trip to the service centre to fix. Q12: So finally, which one is better value? Ans: Tata Motors has priced the Nexon quite well, with the top-end diesel variant undercutting the Brezza. But it’s the Brezza that feels like better value - it has more equipment, like auto headlamps, rain-sensing wipers; and the better hardware when it comes to the touchscreen and reversing camera. The Nexon’s trump cards are its music system and drive modes. Q13: So finally, which one should you put your money on? Ans: The heart says Nexon, doesn’t it? The Tata’s racy design, premiumness on the inside, its city-friendly nature and its tempting pricing make it a very appealing product. But the Brezza isn’t without virtue. It is the more fuel efficient package here while being more peppy and fun. It is the one that feels more spacious and has a more practical cabin. And, barring the music system, the Maruti has the better feature list. But the balance still rides in the favour of the Nexon. That is until we come to the niggles. We faced a fair bit with the Nexon and despite a visit to the service station our concerns weren’t fixed. So when you factor that into the equation the Nexon can’t be recommended without hesitation. Sadly, after the Tiago and Tigor, it feels like Tata has taken a step back on this front. So it’s really a case of Tata and Nexon throwing away its advantage here, and handing the lead to the Brezza. There’s no doubt about it -- the Maruti Suzuki Vitara Brezza is a capable package though it won’t pull at your heart strings like the Nexon does. However, until we are sure that the Nexon’s issues are a thing of the past we’d be happier putting our ten-lakh rupees on the Vitara Brezza from Maruti Suzuki.